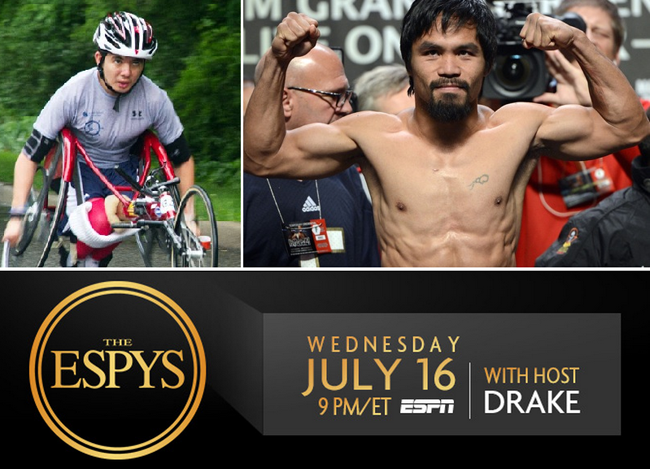 ESPN's Excellence in Sports Performance Yearly (ESPY) awards online voting is open for those who would like to support their favorite athlete. This year, there are so many categories opened for those who would like to vote. The competition is tough since the list is not for mediocre fighters, players and teams but the best of the bests. When you visit the official site of ESPY, you will see the different categories for voting. It is important to consider the deadline for voting which will be on July 16, 2014 @ 9PM/ET. The awarding ceremony is to be hosted by Drake. In the said awarding, there are two Filipinos who entered two separate categories. The first one is boxer Manny Pacquiao for Best Fighter. Manny is with Jon “Bones” Jones of MMA, Floyd Mayweather of boxing, Ronda Rousey of MMA and Andre Ward of boxing. The second one is Raymond Martin for Wheelchair Racing. He is vying for the title of Best Male Athlete with Disability along with Mark Bathum of Alpine Skiing, Declan Farmer of Sled Hockey, Mike Shea for Snowboarding, and Evan Strong for Snowboarding. If you want to support the two Pinoy athletes, better hurry since time is running out. Kevin Durant "Oklahoma City Thunder"
Josh Beckett "Los Angeles Dodgers"
Dominic Moore "New York Rangers"
Russell Westbrook "Oklahoma City Thunder"
Damian Lillard "Portland Trail Blazers"
Masahiro Tanaka "New York Yankees"
Jimmie Johnson "NASCAR Sprint Cup Champion"
Kawhi Leonard "NBA Finals MVP"
Shabazz Napier "NCAA Tournament MOP"
David Ortiz "World Series MVP"
Auburn vs. Alabama "Iron Bowl"
Colts vs. Chiefs "Wild-Card Game"
Rangers vs. Kings "Stanley Cup Finals Game 5"
UConn wins NCAA title "Men's NCAA Basketball"
Mercer over Duke "Men's NCAA Basketball Tournament"
Weidman over Silva "UFC 162"
Jamaal Charles "Kansas City Chiefs"
Blake Griffin "Los Angeles Clippers"
Clayton Kershaw "Los Angeles Dodgers"
Mike Trout "Los Angeles Angels"
Anze Kopitar "Los Angeles Kings"
Henrik Lundqvist "New York Rangers"
Geno Auriemma "UConn Women's Basketball"
John Farrell "Boston Red Sox"
Kevin Ollie "UConn Men's Basketball"
Gregg Popovich "San Antonio Spurs"
Tim Cahill "New York Red Bulls"
Marco Di Vaio "Montreal Impact"
Robbie Keane "Los Angeles Galaxy"
Elena Delle Donne "Chicago Sky"
Candace Parker "Los Angeles Sparks"
Johnny Gaudreau "Boston College Hockey"
David Taylor "Penn State Wrestling"
Jameis Winston "Florida State Football"
Micha Hancock "Penn State Volleyball"
Tatyana McFadden "Sit-Skier / Wheelchair Racer"
The ESPY awards is a prestigious awards by ESPN in recognition to the sportsmanship and skills shown by these nominated athletes in their respective sports field. Who will win this year? Will the two Filipino fighters be able to bring home the crown?